Mark Ling, Gerry Cramer + Rob Jones – Profit Engine Affiliate Marketing Training High Ticket Launch Affiliate Program JV Invite, More. Welcome to the JVNP 2.0 Update featuring a primary JV invite courtesy of fellow JVNP 2.0 Partners Mark Ling, Gerry Cramer + Rob Jones (Profit Engine affiliate marketing training launch high ticket ClickBank affiliate program JV invite), Buzz Builders, and More … in Today’s this Ling thing is turbo charged edition. Fellow JVNP 2.0 Partner, what do you get when three of the most successful ClickBank marketers of all time bust open the secrets to their extremely successful business model? You get a high converting, killer launch that you are not going to want to miss! Internet Millionaire Mark Ling has partnered up with ClickBank BEASTS Gerry Cramer and Rob Jones, combining their unique skill sets to put together one of the most comprehensive programs of 2018. Short on Time? Jump Right on Over to the JV Page for Complete Details. Mark alone has been responsible for over $100 Million in online sales throughout a variety of niches, including dating/relationships, personal development, alternative beliefs, dropshipping, and a lot more. And he’ll be contributing all of that knowledge and experience to this one-of-a-kind program. Then there’s Gerry and Rob, who along with their students over the past 18 months, have held as many as 8 out of 10 of the top affiliate places in ALL of ClickBank! They have had monumental success throughout many niches, including make money and weight-loss. >>> Learn More or Sign Up for Launch Now. Help Us help YOU earn your BIGGEST Commission Payment of the Year! For This Launch, ONLY, Earn Between 60% & 70% Affiliate Commission on ALL SALES! The launch runs from May 7th – May 18th, 2018 featuring two key mailing pieces your tribe will be sure to love – a fun quiz about success and a direct webinar invite. 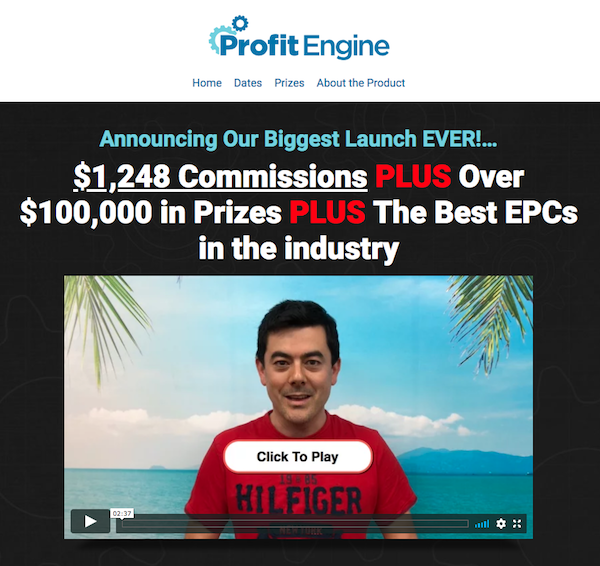 The launch funnel will be optimized to ensure MAX EPC’s and huge commission payouts! And for this launch only, you’ll earn between 60% and 70% affiliate commission on all sales! Glen + Natalie Ledwell – Mind Movies – Mind Movies Matrix Spring 2018 JV page. Get in on the BTI May Flash Sale – Earn Commission Helping Your Referrals Save up to 50% on Brian’s Best-Selling Products! From now, until May 27th (at midnight) 2018, your referrals will be able to grab some of Brian’s best-selling products at up to 50% off! Whether they’re looking to improve their speaking, writing, business, or selling – there will be something for everyone during this flash sale. Brian Tracy International’s New Affiliate Program for 2018. Brian Tracy – Brian Tracy International – Epic May Sale 2018 Promotion affiliate program registration. Earn up to $415 Per Lead JVing with the Gents Behind THIRTY #1 Best Sellers! 100,000 Units Sold. 30 #1 Best Sellers. NEW: Flickstr: TINY LITTLE VIDEOS THAT SELL! Earn Up To $415 Per Lead. $9.81 EPC. 23% F/E Conversions. 87.1% OTO Conversions. 50% commissions 4 Level-DEEP Funnel. $12,500 JV Contest & Cash Prizes, Swipes, Video Ads, Creatives & Much More HERE => Mo Latif + Brett Ingram – Flickstr Launch Affiliate Program JV Page. JV with Bryan Winters and Earn up to $250 Per Click! Bryan Winters’ ViraLightning viral income platform launches Thursday, May 24th, at 10 a.m. eastern! Make $250 per click on software that will BLOW YOUR SUBSCRIBERS AWAY. $1,000 cash to the top JV, and more. GET READY!! Bryan Winters – ViraLightning JV page. Fred Lam + Michael Shih, Rob Thompson, Travis Stephenson, Sara Young + Andrew Hansen and other fellow JVNotifyPro 2.0 partners are waiting in the wings … keep your eyes on your Inbox, and follow the action in the JVNP 2.0 Premium VIP JV Announcement archives. Posted in High Ticket Product Launches + Affiliate Programs, Internet Business + Marketing, Joint Venture Announcements	| Tagged Affiliate Marketing, affiliate marketing training, Affiliate Program, Affiliate Programs, Buzz Builders, ClickBank, evergreen affiliate programs, Find Affiliates, Find JV Partners, Gerry Cramer, High Ticket Launch, Home Business, Internet Marketing, Joint Ventures, JV Calendars, JV Invite, JVNewsWatch, JVNotifyPro, Launch Calendars, Make Money Online, Mark Ling, Marketing, Mike Merz, Need Affiliates, Need JV Partners, New Product Launches, Niche Marketing, Online Business, Profit Engine, Rob Jones, Work At Home	| Comments Off on Mark Ling, Gerry Cramer + Rob Jones – Profit Engine Affiliate Marketing Training High Ticket Launch Affiliate Program JV Invite, More.